Posted January 18, 2018 by Daisy May Sitch & filed under Beauty, Clients, Featured, Home Page Features, Instagram, Just for Fun, Lifestyle, London, Media, Push PR London, Social media. New Push beauty client, Chop Chop London is switching up the salon experience by turning the long, drawn-out appointment process on its head with a series of residencies across London, debuting at Old Street Station on 30th January. While diversity is what underpins the offering (all treatments work for all hair types), the fact that each of the 24 gender fluid express styles are set at £20 and each take 20 minutes is a definite hook. In today’s always-on, always-on-the-move culture where demand for fast, experiential results is exponential Chop Chop London has carved out a real niche. Then there’s Sherman Hawthorne, a Vidal Sassoon trained celebrity session stylist, who is leading the team to drive momentum alongside Founders Kaye Sotomi and Laure Ferrand who have built a brand ethos that focuses on being inclusive and accessible to everyone. The brand’s app and website leverage connectivity, mobility and convenience so that choosing your style and stylist is completely streamlined – as is getting into your seat and seeing results from the session you opt for. Quick trims, layered cuts, dry styling and braiding in the time that it takes to scroll through the latest on your Instagram feed? Genius. 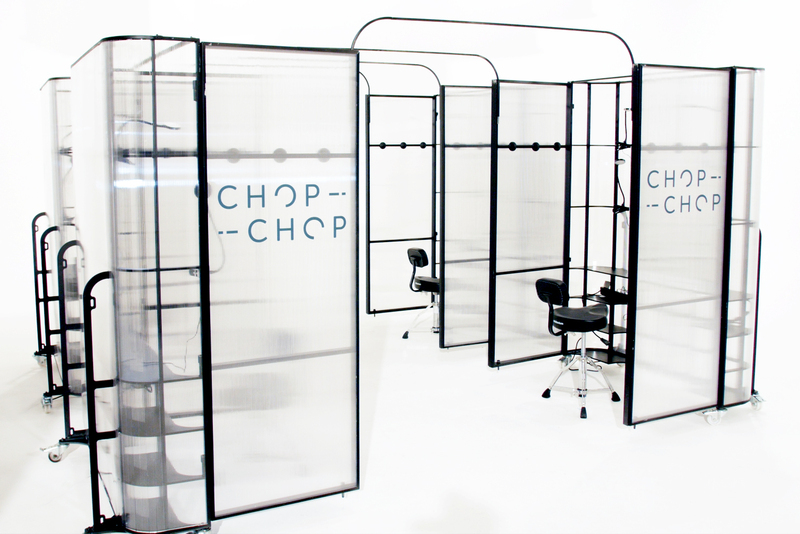 Chop Chop London as a concept is about inclusion, innovation and convenience in hairstyling. Borne out of the sad realisation that three friends of different ethnicities could not walk into a high street salon together for a hair styling service, without one of them being turned down because of the texture of his/her hair. A realisation that was first brought to my attention by my business partner and Co-Founder Laure just over two years ago when she faced a similar experience trying to get her hair done. Also, living in a fast paced city/society the idea of sitting in a salon for 2-3 hours on a weekend just no longer made sense. As patrons we often wondered why the experience couldn’t be less time consuming and inclusive so we sought to do something about it by bringing industry expertise to the table and marrying it up with consumer expectation. Chop Chop London has five key pillars and works in five simple ways: it is inclusive (a service that caters for diversity in all hair and does not distinguish between genders), speedy (a simple menu with 24 styles delivered in 20 minutes), convenient (salon pods located in city hot spots and an app services with virtual queuing that gives customers greater control), affordable (no more than £20 per hair style) and quality (trained and experienced stylists to choose from at your finger tips). We understand, we care and believe that everyone has the right to have fashionable hairstyling which is priced without prejudice. In a world of see-now, buy-now, want-now there is a huge demand for instant results; would you agree and how does Chop Chop cater for this? Yes we completely agree. We live in a time where hyper connectivity and social media has created a generation of empowered global consumers who are more informed and demanding than ever before. The age of obscurity and insincerity is done having been replaced by a more connected, conscious and empowered consumer world. Chop Chop caters for this by making regular visits to the salon more accessible. By offering seasonal menu updates, drawn from trending styles and by inviting our customers to participate in co-creation. To offer a truly inclusive, high quality and transparent hair styling experience. A fun service that is accountable to our consumers and provides genuine opportunities for our stylists, whilst keeping them in a creative environment. What does representation mean to the brand and how will it be championed? Representation means everything to us as a brand. At Chop Chop we don’t see hair texture or gender, we just see hair and we love all hair! We believe every brand has a moral and economic obligation to celebrate the diversity of their customers. We champion representation by offering an inclusive service menu. By adopting this same philosophy when hiring staff and by proudly celebrating diversity on our digital and media outlets. How important is the role of digital and social media for Chop Chop London? It is absolutely critical. The marrying up of consumer expectations with the actual service experience is paramount, that is why we will launch our service with an app that empowers the customer to do things like virtually queue, click and pay, and rate the service they received. Our social media will feature user generated content and customer co-creation will allow use engage our patrons whilst also providing testimonials for our services. Our ability to capture the customer experience and feedback through these platforms will also help to keep us innovating.